I was once beguiled by a photograph of a box of six glazed doughnuts – no holes apparent – each split open and laden with strawberries incandescent with syrup. Some sleuthing discovered their providence; the Donut Man, located 30 minutes east of Los Angeles in Glendora Calif., and opened by Jim Nakano 46 years ago. I’ve never been to the Donut Man, although I’m eager to visit. But sometimes, the suggestion of a recipe is enough to impel a fondness. In this case, warm dough cradling sun-sweet berries that sang intoxicatingly of summer, and beyond that, sounded undeniably good. I made my own, and the reality confirmed the hypothetical. Now, on the threshold of strawberry season, and the profusion of other shortcake-worthy fruit to follow it, it seems appropriate to return to the recipe. That said, these are not intended as a copy of the Donut Man. Instead, they’re my stopgap solution until I can arrive at Nakano’s door. For mine, I use an eggy, buttery brioche dough, scented with vanilla and orange, feathery-crumbed yet with structure to bear the fruit. (Using bread flour contributes to both the loft and strength of the dough. Resting the dough overnight before frying and glazing further develops its texture and flavour.) The berries, dressed in ruby port to bring out their scarlet blush, complete the picture. One note: The doughnuts are best the day they are made. For a less-generous batch, divide the dough in half after its time in the fridge. Freeze a portion for up to two months in a zip-lock freezer bag with all the air pushed out. Pour milk and water into the bowl of a stand mixer, and sprinkle yeast and sugar over top. Wait until foamy, 5 to 10 minutes. Stir in the egg, followed by the flour, and to form a wet mass. Cover with plastic wrap and mature sponge for 45 minutes on the counter. Make the dough. Tip the flour, sugar, and salt onto the sponge. Pour in the eggs, then scrape in the orange zest and vanilla seeds. Attach the dough hook to the stand mixer, and lock the bowl in place. Turn to medium-low and run for a minute. Shift speed to medium and knead, stopping and scraping the bowl as needed, until the dough first collects around the hook, then smacks against the sides of the bowl, 10 to 15 minutes. If the dough sags against the hook rather than climbing up it, sprinkle with stingy tablespoons of flour, administered one at a time, until it mounts. Endeavour to use the least flour possible. Once the dough is bouncily slapping around the bowl, introduce the butter. Working in three additions with the mixer running, pop walnut-sized nubs of butter into the bowl. With each serving of butter the dough will soften, then spring back to life. Continue to knead until shiny and elastic. Scrape the dough into a large, greased bowl and press greased plastic wrap directly onto its surface. Let stand at room temperature for 1 hour. Without punching down, gently stretch an edge of the dough up, then pull it over the centre of the bowl, and let it fall back. Rotate the bowl and repeat, working your way around, lifting and extending the dough over itself until you’re back where you started. Gently slide your hand under the dough and flip the smooth side up (the ball will now be sitting on the collected edges from the stretching)​. Press the plastic wrap against this flawless cheek, and refrigerate for at least 4 hours and preferably overnight. Remove dough from the fridge 15 minutes before turning out onto a lightly floured surface. Roll to a generous 1/2-inch thickness. With a sharp knife and ruler, cut 16 portions, each 2 1/4-inch square. Reroll scraps once if needed. Sit the squares on a parchment-lined baking sheet. Tuck them under a lint-free towel until almost doubled in size, about 1 hour. Make the glaze by stirring the icing sugar, salt, butter, and vanilla together in a medium bowl. Beat in enough cream to make a thick but pourable glaze. Cover and set aside. Get the fruit in order. Slice the berries in halves and quarters, depending on size. Fold in sugar, then douse with port. Fold again and keep at room temperature until serving. Heat 3 inches of oil in a Dutch oven over medium heat to 350°F (180°C). When the doughnuts have risen, use a fish slice or slotted spoon to transfer 3 to the pot at a time. Fry, turning periodically, until bronzed and puffed, approximately 3 to 4 minutes. Retire the doughnuts as they are cooked to a baking rack lined with paper towels. Continue frying until all the doughnuts are done. While still warm, Turn each doughnut completely in the glaze, then allow them to set on another baking rack, this one placed over a rimmed baking sheet (Use the one from proofing the doughnuts to save on cleanup). 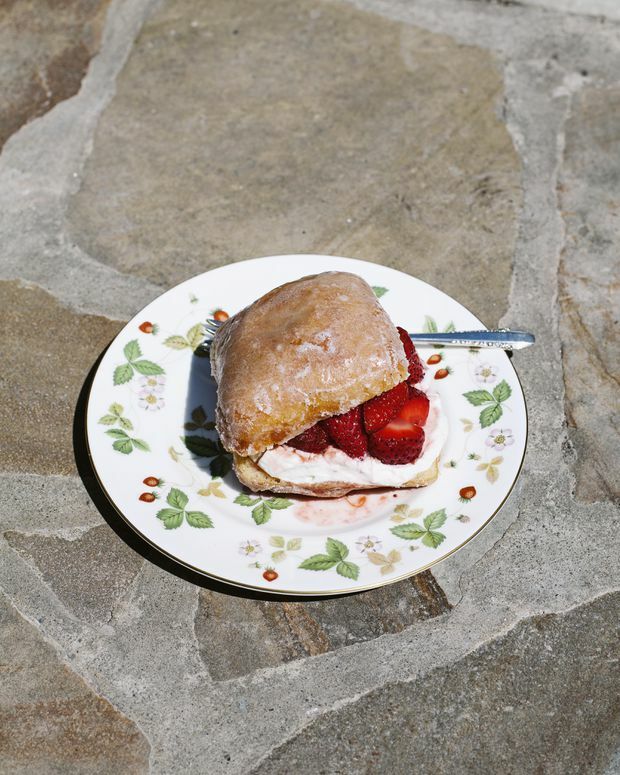 To serve, cleave a doughnut in two through its equator, then stuff with strawberries, sugared crème fraîche, and a spoonful of the collected berry juices. Feast.